An easy vegan pasta puttanesca recipe, and low-fat, too! 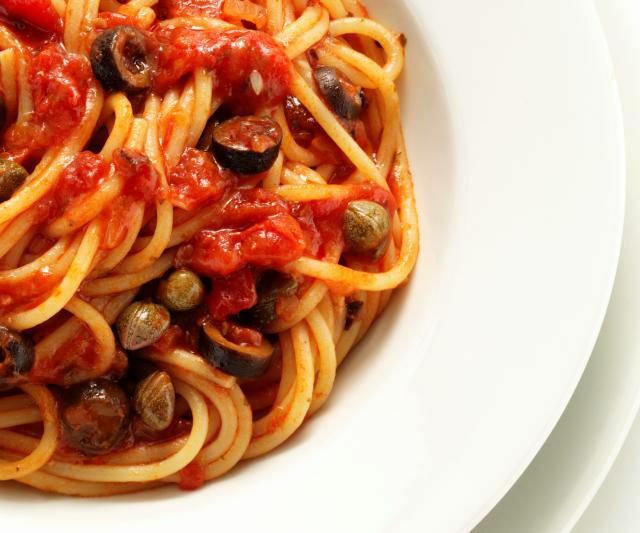 Pasta puttanesca is a low-fat pasta sauce recipe with capers, kalamata olives and red pepper flakes in a sauce similar to a marinara sauce. If you aren't eating vegan, you could, of course, topped this off with some fresh shaved Parmesan cheese, but I think you'll find this recipe is delicious on its own and you don't even want the Parmesan topping. This Italian pasta puttanesca recipe is both vegetarian, vegan and gluten-free, though regular pasta is not gluten-free, so pair the puttanesca sauce with a gluten-free alternative. Sauté the garlic in olive oil for a minute or two. Add the basil, capers, olives, and red pepper flakes, and cook for another two minutes. Reduce heat to low, and add the brine and tomatoes. Cover and simmer for at least 15 minutes.